This is the Ruger Avenue Bridge of the I-39/90 Central segment in Janesville, Wisconsin. The photo shows the girders set on the abutments looking south and the workers are setting up forms for the concrete deck. It is the northbound structure designed by Westbrook. 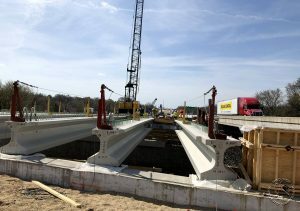 A twin southbound structure, also designed by Westbrook, is expected to be built approximately late spring 2019.